At the invitation of Canon Bayly who has gone as Chaplain to the Bishop during his Labrador visitation, I went to Bonavista on Wednesday (July 12th) to officiate at the marriage of two of his parishioners. Before the hour appointed for the wedding, however, I was called upon to bury a little child —Marjorie Templeman— This gave me an opportunity to spend an hour in the cemetery and the Mortuary Chapel. The cemetery is beautifully situated, uniformly laid off in lots, with fairly well kept paths all through it. The graves show indications of loving care, and the majority of them are marked by a well proportioned marble cross, thus giving the cemetery a distinctively Christian appearance. A beautiful Lych-gate of which there are so few in Newfoundland guards and admits to the cemetery. The Mortuary Chapel is a well proportioned and Church-like building. It is fitted with an Altar, a Lectern, and a few seats, and the roof and walls are neatly finished with wood in natural colours. 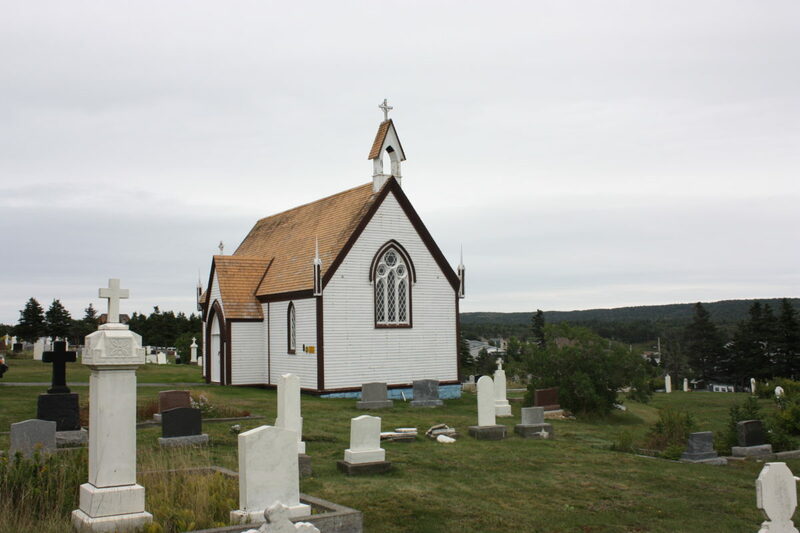 This is one of the three Mortuary Chapels in the Diocese (St. John's, Bonavista and Trinity) and if it were fully fitted with seats, the windows filled with stained glass memorials, and the exterior given a fresh coat of paint, it would constitute an easy first of the three. Under the shadow of the east end of the bulging lie the bodies of the father and mother of Canon Bayly, whose names bring back a flood of happy, holy memories to those who were privileged to know them in the parish and in their home. Grant them Lord Eternal rest.